Cannas are bold plants that are grown for their striking flowers and foliage. 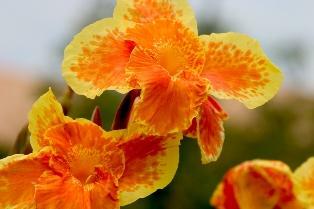 They offer showy, tropical color all summer long. Flower colors include brilliant yellows, oranges, pinks, and reds. The large foliage is as flashy as the flowers. Leaves may be green, bronze, or burgundy and are often striped or marbled. Cannas belong to the Cannaecae family and have leaves resembling banana leaves. They are tropical and sub-tropical perennials that flower year-round and can reach 10 feet high in their native habitat. In temperate regions, they are handled as tender annuals and rarely exceed 4 feet to 6 feet high. There are dwarf varieties that grow only 1 1/2 to 2 feet tall. Cannas grow from bulb-like structures called rhiozomes. They can be purchased as rhizomes or in pots. They prefer full sun and a fertile, well-drained soil, but will tolerate a wide range of growing conditions. Many can even be grown in wet, poorly drained sites and shallow ponds. Plant rhizomes in the spring, after danger of frost has passed. If necessary, mix plenty of organic matter such as compost into the soil. Place rhizomes 3 to 4 inches deep and 1 to 3 feet apart. You can also start rhizomes in pots in February or March. Transplant them into the garden after danger of frost. These plants will flower earlier than those from rhizomes that are planted directly into the ground. Cannas thrive in high summer temperatures. Keep soil moist all season long. A thick layer of organic mulch helps conserve moisture and adds nutrients to the soil. For optimum growth, apply a nitrogen-rich, organic fertilizer once a month during the summer. Remove spent flowers to maintain their attractive appearance and promote additional blooms. In most of the country, cannas will not survive the winter outdoors; you must dig up the rhizomes in the fall. After the plants have frozen, cut them back to within 4 to 6 inches of the ground. Then, carefully dig up the canna clumps with a spade or fork. Allow rhizomes to dry for several hours and then place them in boxes, wire crates, or paper bags. Store the cannas in a cool (40 to 50°F), dry location until the following spring. Large clumps can be divided in the spring, leaving three to five buds per section. In the warmest parts of the country, rhizomes can remain in the ground over the winter. Divide and replant established plants every three to four years to avoid overcrowding. Add a heavy layer of mulch to protect rhizomes from freezing. Gardeners have many canna varieties to consider. Some interesting and popular varieties are listed below. 'Black Knight' is a stylish plant with bronze leaves and dark, crimson red flowers that grows 3 to 3 1/2 feet tall. 'City of Portland' produces beautiful, coral pink blossoms with green foliage on 31/2- to 4- foot plants. 'Cleopatra' has large, strikingly two-toned flowers-a mixture of yellow petals flecked in red and solid red petals. Plants grow 3 to 4 feet tall. 'Lucifer' is a good choice for smaller gardens or pots because it grows just 2 ft high. It has red and yellow flowers with bright green leaves. 'Miss Oklahoma' - watermelon pink blossoms, green foliage, 3 feet tall. 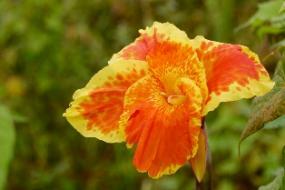 'Pretoria', or 'Bengal Tiger', grows 4 to 6 feet tall with orange flowers and yellow and green striped foliage. Silvery white and green pinstriped leaves make 'Striped Beauty' a lovely addition to any garden. Yellow flowers have white markings. This variety grows 3 feet tall and is among the most dependable varieties for water gardening. *'Stuttgart' has orange flowers with green and white variegated foliage and grows 3 to 4 feet tall. 'The President' has scarlet blossoms with green leaves and is 3 to 3 1/2 feet tall. 'Tropicanna' has stunning colored foliage. Purple leaves are striped with pink, red, and green veins that fade to sunset orange. Smaller, orange blooms are held well above the foliage. 'Wyoming'-3 to 3 ½ feet tall-has huge, purple-veined leaves and warm, apricot-orange flowers. Cannas can be used in borders, where their colorful foliage provides interesting background material. Traditionally, they have been grown in masses at the centers of formal flower beds in lawns, parks, and other public places. Cannas can be used as temporary screens. *The smaller varieties perform well in large containers. Plant them in wildlife gardens to attract hummingbirds. The purple-leaved varieties look great with silver-leaved plants. They also contrast brilliantly with orange or scarlet flowers.